Review “Pilgrim’s Progress” (A Red Orchid Theatre): Wacky and Smart! A Red Orchid Theatre presents the World Premiere of PILGRIM’S PROGRESS. 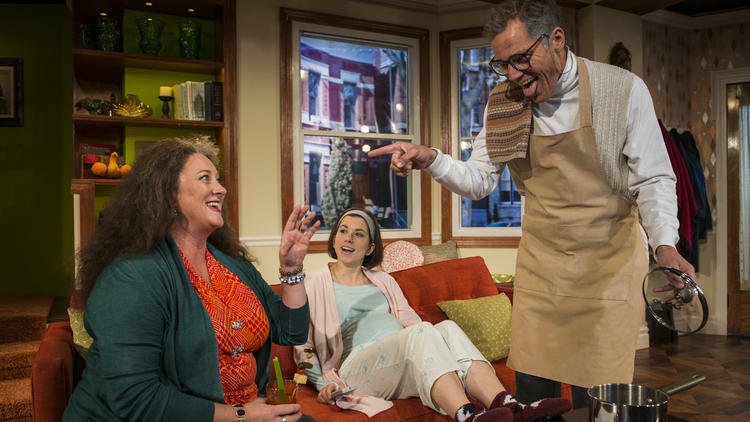 In two words, Playwright Brett Neveu’s tale is wacky and smart! This quirky family Thanksgiving is a charcoal black comedy. Dad is a stage actor. Mom is a psychologist. Son is an earth-poet. And daughter is a pregnant teen. Neveu’s characters are each unique. And their individual and collective issues makes the absurdity level lethal. Under the masterful direction of Shade Murray, the sublime ensemble deliver the humor and the obscene with equal intensity. The show starts out normal… for a minute. Michael Shannon (Jim) is cooking his famous cranberry sauce. Kirsten Fitzgerald (Melissa) is slurping on a bloody mary. And Charlotte Mae Ellison (Rania) is anxiously looking out the window. General Thanksgiving chit-chat is riddled with Shannon and Fitzgerald debating the terms of a contract. The contract defines how many people Ellison must talk to at the annual Thanksgiving party. The idea is WTF crazy and this is only the first of many contracts to be discussed and debated. Neveu’s script boils over with stories upon stories and contracts upon contracts. Shannon continually quotes playwrights from O’Neil to Shepard to Letts. As he begins his reminiscing on a role he played, Fitzgerald perfectly chimes in with ‘your father…‘. One of the best parts of this show is the dynamic between Shannon and Fitzgerald. They are authentically in-sync in their storytelling. They sound flawlessly rehearsed. Not like actors rehearsed but more like a couple that has told the same story mega times. When they describe a Halloween party encounter, Fitzgerald calmly and hilariously bends over the couch as they describe what happened next. The duo finish each others‘ sentences, exchange glances and void contracts as if they have been together for decades. Neveu’s script is an intricate word play. Besides Shannon’s ongoing theatrical narrations, Fitzgerald pops up with patient stories. The delightfully inappropriate Fitzgerald reveals confidential information in her efforts to relate to the current situation. When Ryan Bourque (Desmond) arrives, he adds another layer of associations to the discussions. Bourque talks dirt…literally or recites Whitman in his desire to stay grounded in this flighty family. Between all the contractual, theatrical, therapeutical and scientific citing, Neveu skillfully navigates us between fact and fiction. Is this really happening in this family or this a bizarro fantasy? At one point, Shannon forces Bourque and Ellison to act out the terms of the contract. The moment is riveting and surreal. To fully-appreciate the clever convolution of PILGRIM’S PROGRESS, it should be experienced multiple times. This is a problem since the show is sold out. I heard rumor that a few tickets are held back for each performance. I would recommend putting A Red Orchid box office on speed dial at 312-943-8722. Good luck!